-NO2 is an EWG and a meta director. Let's draw an EAS reaction's cyclohexadienyl cation intermediates to demonstrate why this is true. I've started you off. What's good about meta? What's bad about ortho/para? Short answer: -NO2 is an meta director because the cyclohexadienyl intermediates that result from meta addtition are more stable than those that result from ortho or para addition. Long answer: Addition at both the ortho or para positions lead to a cyclohexadienyl cation that contains two adjacent positive charges. This is very unstable, and so addition at the ortho or para positions is not favored. 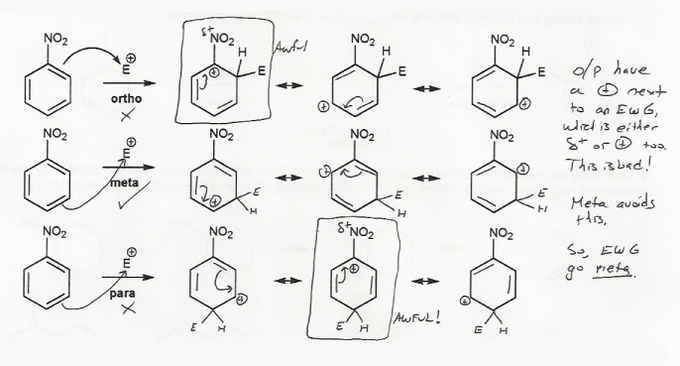 The cyclohexadienyl cations that result from meta addition don't have this problem. This will be the base for any substituent that has a positive charge (or partial positive charge). 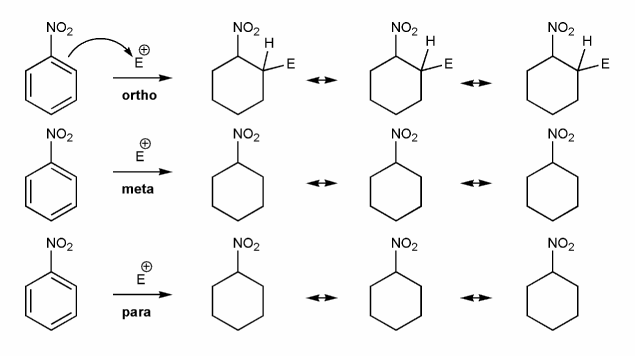 So -NO2, -C(O)R, -CF3, -NH3+, -CN, and -SO3R are all meta directors. MendelSet practice problem # 590 submitted by Matt on July 9, 2011.